Spider, the spider, meets a bird called Bird. Bird is hungry. Bird wants to eat. But not fish, Bird wants to eat chocolate. Together they go looking for chocolate and then find themselves in the jungle of Africa. 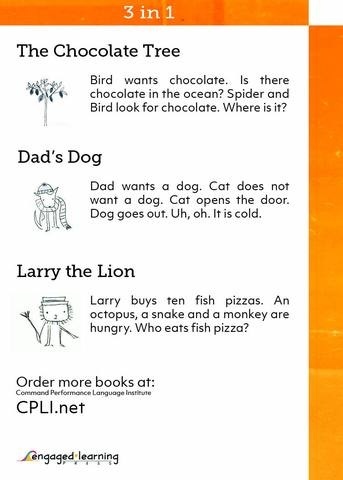 This story and two more, just as funny, help children who are starting to learn English on their way. Dad's Dog is written in easy to understand English. Often repeated high-frequency words and simple sentence structures help beginning learners to understand and aquire the language. The book has a glossary, based on pictures, and a comprehension quiz for each story at the back. Learn English with stories. An inspiring workbook for children in which the stories are told, read and processed in a playful way.